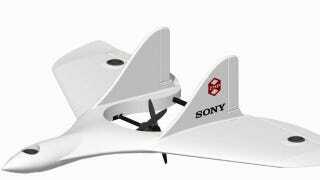 Sony is making drones now, partnering with an autopilot technology startup to create a drone company called Aerosense. This might seem like a strange zag into an unfamiliar business for Sony, but it dovetails with the company’s mission to become a sensor powerhouse. Aerosense’s drones will use Sony’s image sensors, the same ones used in Apple and Samsung smartphones. Sony scuttled its PC business by cutting VAIO loose, and isn’t as focused on making smartphones anymore. What it is focused on is its in-demand sensors, so this move makes a lot of sense. “We’re looking to explore new opportunities beyond our core consumer portfolio in enterprise markets,” said Hiroki Totoki, head of Sony’s smartphone unit, which is providing resources for the drone venture. “The key to driving growth in these areas will be adapting Sony’s innovation in various technologies,” including cameras and sensors, he said. Aerosense will first offer drone services to businesses, to help with aerial land surveys and infrastructure surveys. The company won’t actually sell its drones, so if you’re dreaming of a sleek Sony-branded personal quadcopter, that day has not arrived.